Dianne Mueller of Port Washington, formerly of Grafton, passed away peacefully on Thursday, July 21, 2016 at Columbia St. Mary’s Hospital in Mequon. She was 55 years old. Dianne was born in Fort Worth, TX on December 17, 1960, daughter of Frederick Mueller and Dorothy Witt Mueller. Dianne grew up in the Grafton area and graduated from Grafton High School in 1979. After high school, Dianne attended and graduated from MBTI in Milwaukee. Ms. Mueller worked for many years as a manager at Culver’s Restaurant in Grafton. She took great care of her customers and they loved her like a daughter. 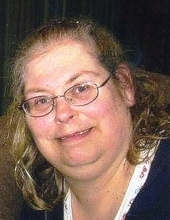 Dianne was a member of Sovereign Grace Bible Church in Fredonia, and a 25 year member of the Ozaukee Chorus. Dianne loved to sing, and found great joy singing in church or performing with the Ozaukee Chorus. She was a former member of the “Great Pretenders” of Ozaukee County and has also been an active member of Girl Scouts her entire life. Dianne was an avid fan of the Green Bay Packers. Dianne is survived by her father Fred of Port Washington, siblings Debbie (Chris) Hill of Port Washington and Paul Mueller of Port Washington, her nephew Tyler (Carol) Hill, numerous aunts, uncles, cousins other relatives and many friends including her very special friends Doug and Marcie Ferrell. Dotty, the family’s dog also had a special place in her heart. She is preceded in death by her mother Dorothy. Funeral services will be held on Thursday, July 28th at 3 PM at the Eernisse Funeral Home, 1600 W. Grand Ave. in Port Washington. She will be laid to rest next to her mother in St. Mary’s Cemetery in Saukville. Visitation will take place on Thursday, July 28th at the Funeral Home from 1-3 PM. Please dress casual for Dianne’s Celebration of Life. To send flowers or a remembrance gift to the family of Dianne Marie Mueller, please visit our Tribute Store. "Email Address" would like to share the life celebration of Dianne Marie Mueller. Click on the "link" to go to share a favorite memory or leave a condolence message for the family.